Warm up and look good at the same time! This simple crochet pattern is great for an lazy afternoon. To make the Bargello Throw, you need a Size J hook, a yarn needle and Simply Soft Caron Yarn. One size US J-10 (6mm) crochet hook, or size to obtain gauge. In single crochet, 11 sts = 4"/10cm; each panel measures approx 7 x 52"/18 x 132cm. long-sc: Long single crochet —Insert hook in indicated stitch in indicated number of rows below, yarn over and draw up a loop (to current row height), yarn over and draw through two loops on hook. Notes: Take care to draw up the loop to the current row height so that the stitch doesn't pull downwards. Do not work into the corresponding stitch in the current working row. The row into which a stitch is usually worked is "1 row below" the current row (being worked). A stitch "2 rows below" is in the row immediately beneath the row into which a stitch would usually be worked. Similarly, a stitch "3 rows below" in the row 2 rows beneath the row into which a stitch would usually be worked. NOTE: To change color, work last stitch of old color to last yarn over, yarn over with new color and draw through all loops on hook. Proceed with new color. Row 1 (RS): Sc in 2nd ch from hook and in each ch across, turn—145 sc. Rows 2–5: Ch 1, sc in each sc across, turn. Row 6: Ch 1, sc in each sc across, change to B in last sc, turn. Fasten off A. Row 7: With B, ch 1, *sc in next sc, long-sc in next sc 2 rows below (Row 5), long-sc in next sc 3 rows below (Row 4), long-sc in next sc 4 rows below (Row 3), long-sc in next sc 5 rows below (Row 2), long-sc in next sc 6 rows below (Row 1); repeat from * across to last sc, sc in last sc, turn—24 pattern repeats. Rows 8–11: Ch 1, sc in each sc across, turn. Row 12: Ch 1, sc in each sc across, change to C in last sc, turn. Fasten off B. Row 13: With C, ch 1, *sc in next sc, long-sc in next sc 2 rows below, long-sc in next sc 3 rows below, long-sc in next sc 4 rows below, long-sc in next sc 5 rows below, long-sc in next sc 6 rows below; repeat from * across to last sc, sc in last sc, turn. Rows 14–17: Ch 1, sc in each sc across, turn. Row 18: Ch 1, sc in each sc across, change to C in last sc, turn. Fasten off B. Rows 19 and 20: With A, repeat Rows 13 and 14. Fasten off A. Turn panel to begin working across opposite side of foundation chain. Note: In next row, the long-sc are worked into the same sts as the long-sc that were (previously) worked in Row 7. Row 1 (RS): With RS facing and working across opposite side of foundation chain, join B with sc in first ch, * long-sc in next sc 2 rows below, long-sc in next sc 3 rows below, long-sc in next sc 4 rows below, long-sc in next sc 5 rows below, long-sc in next sc 6 rows below, sc in next ch; repeat from * across, turn. Rows 2–14: Repeat Rows 8–20 of first half of panel. Fasten off. Assembly: Hold two panels with WS facing each other, join A with sl st in corner of one panel to work across long edge, ch 1, sl st in corresponding sc of 2nd panel, *ch 1, sl st in next sc of first panel, ch 1, sl st in next sc of 2nd panel; repeat from * across long edge until all sc of long edge have been worked and the two panels joined. Fasten off. Repeat this process to join all panels across long edges. Trim: With RS facing, join A with sl st in any corner. Round 1: Ch 1, sc evenly spaced around, working 3 sc in each corner; join with sl st in first sc. Round 2: Ch 3 (counts as dc), dc in each sc around, working 5 dc in center sc of each 3-sc corner; join with sl st in top of beginning ch. Fasten off. Want to see more crochet throw patterns? 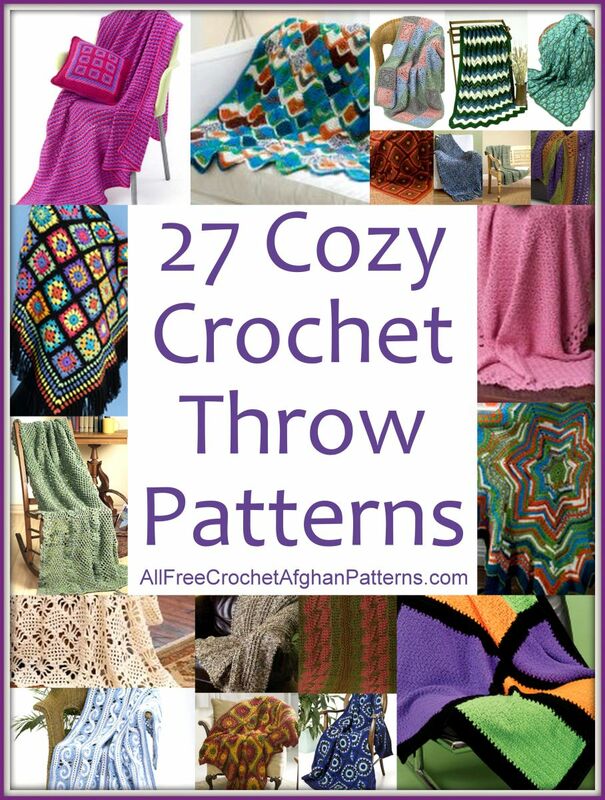 Check out our collection of 27 Cozy Crochet Throw Patterns for more easy to crochet throws! Wow, how great looking is this Bargello Throw! I love the colors and the design is just lovely! I haven't done the long single crochet stitch before, but so have to make this, even if it's a lap afghan. The pattern is well written and easy to understand and follow. I like that the written pattern is right here on this page and easy to print or save by right clicking with the mouse and saving to my lap top. Love it!! Thank you so much for sharing this free crochet pattern.